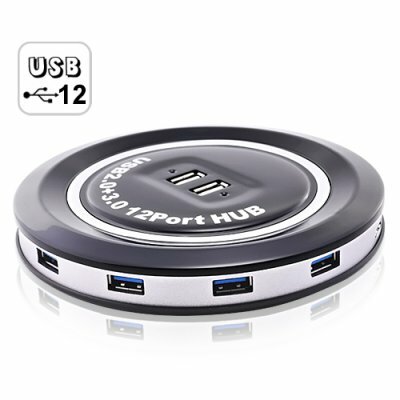 Successfully Added Warp Speed - 12 Port 3.0 + 2.0 USB HUB to your Shopping Cart. Beam me up Scotty! With the use of this USB 3.0 HUB, you'll experience amazing transfer speeds of up to 5GB's per second. NOW... that's something that was reversed engineered from the starship enterprise and made available just for you! - Take it out of the box. - Finally, transfer any file you like in a blink of an eye. OK... so why do you need a USB 3.0 HUB? Seriously, fast data transfer from one location to another makes both life and work so much more convenient and stress free. Whether you wish to transfer hundreds of GB's of music, movies, and videos or just an astronomical amount of work files from one location to another. This USB 3.0 HUB will save you the hours; after all, you're only really awake 16 hours a day. Why waste much of that waiting for your collection of movies, or almost missing the project deadline because you have to wait 2-3 hours to transfer files from one location to another. Don't have a USB 3.0 port on your computer? Not a problem! Simply order this product together with our CVTA-K112 USB 3.0 PCI card for desktops, or the CVTA-K113 USB 3.0 Express-card Adapter for laptops, and in a few short days you can finally enjoy amazingly fast USB 3.0 transfer speeds. For less than $39.00 you can easily add 6 high speed USB 3.0 and 6 USB 2.0 connections to your existing USB port. Hurry and order this product now while supplies last and we will ship out your order within 24 hours and even include our full one year warranty. Back to the future! transfer gigabytes of information in less than a minute! Excellent Resale Item! List this hot gadget on you eBay listing page or drop ship storefront, and reep the benefits! How can I tell the difference between the 3.0 USB ports and 2.0 USB Ports? The 3.0 USB ports are Blue, and the USB 2.0 Ports are White. Even if you are using your desktop PC's USB 2.0 port, you will still get more than double the transfer speed by using USB 2.0 to USB 3.0 and vise versa.